GKFoodDiary is celebrating the second blog anniversary!! We are happy that this year we have reached our milestone to migrate our blog from blogger to WordPress! And hearing good reviews from the readers for the same:) Thank you from my bottom of heart for all the encouragement and enormous support through comments, messages and emails. So here is the mango cake recipe to celebrate our blog anniversary! 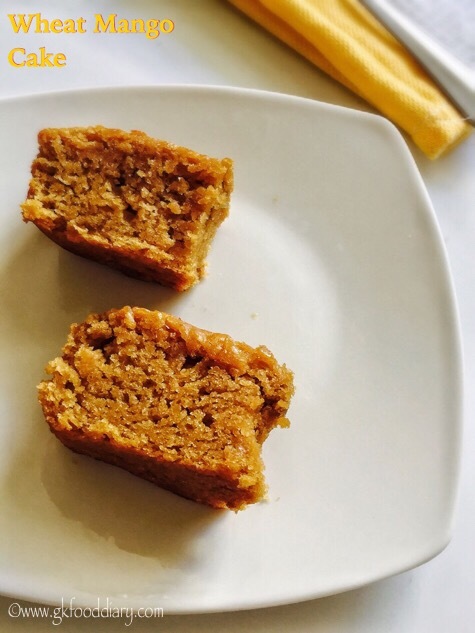 Eggless whole wheat Mango Cake Recipe – easy and healthy cake recipe made with whole wheat flour, mangoes and without eggs! 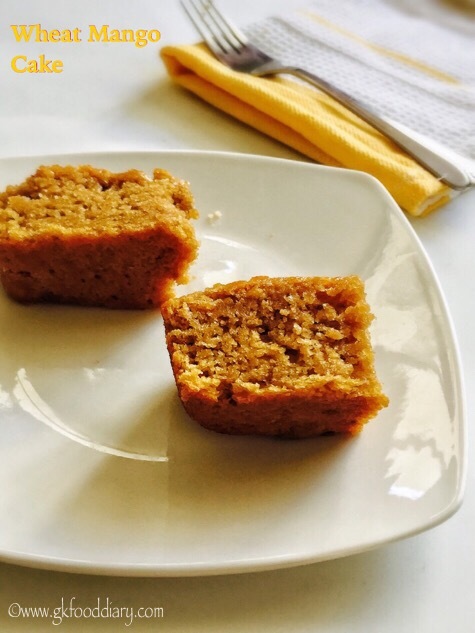 I have already shared a eggless banana cake recipe for which I got good review from the readers. Hence tried this mango cake recipe similar way by replacing bananas with mangoes. It turned out so yummy and it got over in no time:) This whole wheat mango cake can be given to toddlers after one year. This delicious mango cake is a must try for this mango season and don’t miss a chance to treat your kids!! 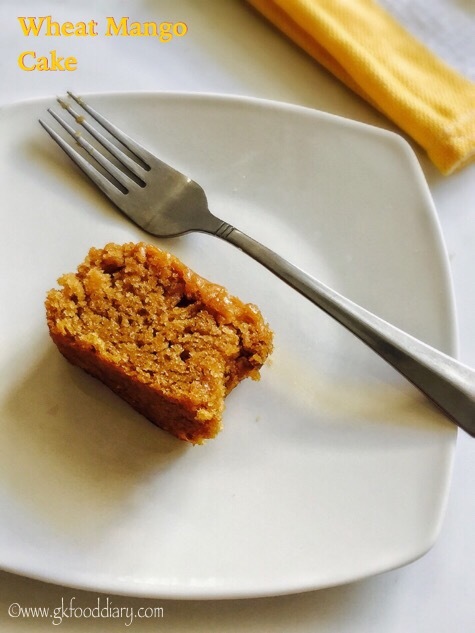 Now Let’s get on to check how to make this healthy eggless whole wheat mango cake. 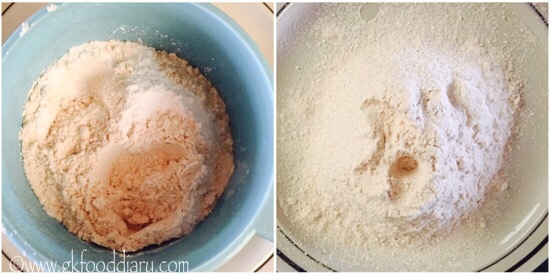 Measure and Sieve the whole wheat flour and mix well with baking soda, baking powder and salt. Also preheat the oven to 180 degrees for 10 minutes. Measure and keep all the other ingredients ready. Take the mangoes and cut them into slices. Then blend the chopped mango pieces in a blender to puree them.It should measure 1 cup of mango puree. In the same blender, add sugar, oil followed by vanilla essence. Blend everything together. Transfer the blended wet ingredients to a mixing bowl, add the sieved whole wheat flour mixture to the wet ingredients.Gently fold everything well for 10-15 seconds. Don't over mix. Then add broken nuts(if using) to the mix and give a stir. The final mixture should be thick. Grease a cake pan with oil. Pour the mixture to the cake tin and gently tape it. Bake in the preheated oven at 180 deg C for 35 -40 minutes (baking time depends on the size of the cake pan and oven) at 180° Celsius till tooth pick inserted in the center comes out clean. Allow to cool in tray for 5 minutes once done. Once the cake is warm, cut into pieces and serve! 1. 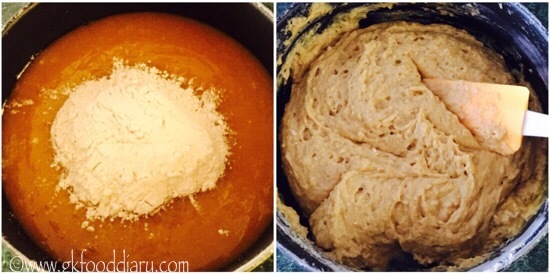 Measure and Sieve the whole wheat flour and mix well with baking soda, baking powder and salt. Also preheat the oven to 180 degrees for 10 minutes. 2. Measure and keep all the other ingredients ready. Take the mangoes and cut them into slices. 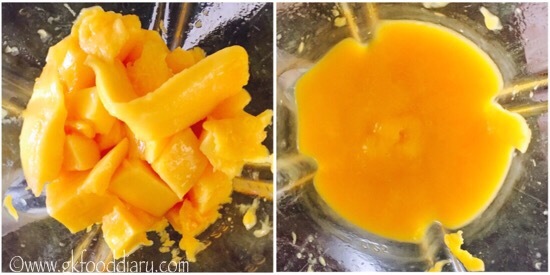 Then blend the chopped mango pieces in a blender to puree them.It should measure 1 cup of mango puree. 3. In the same blender, add sugar, oil followed by vanilla essence. 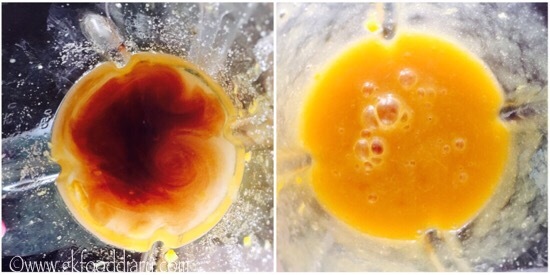 Blend everything together. 4. Transfer the blended wet ingredients to a mixing bowl, add the sieved whole wheat flour mixture to the wet ingredients.Gently fold everything well for 10-15 seconds. Don’t over mix. Then add broken nuts(if using) to the mix and give a stir. The final mixture should be thick. 5. Grease a cake pan with oil. Pour the mixture to the cake tin and gently tape it. Bake in the preheated oven at 180 deg C for 35 -40 minutes (baking time depends on the size of the cake pan and oven) at 180° Celsius till tooth pick inserted in the center comes out clean. 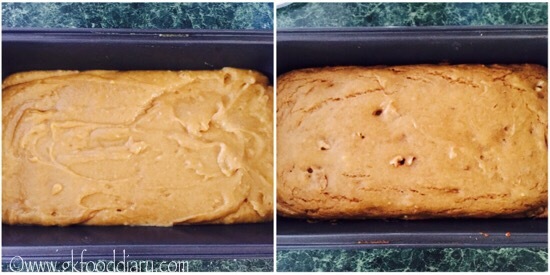 Allow to cool in tray for 5 minutes once done. Once the cake is warm, cut into pieces and serve! 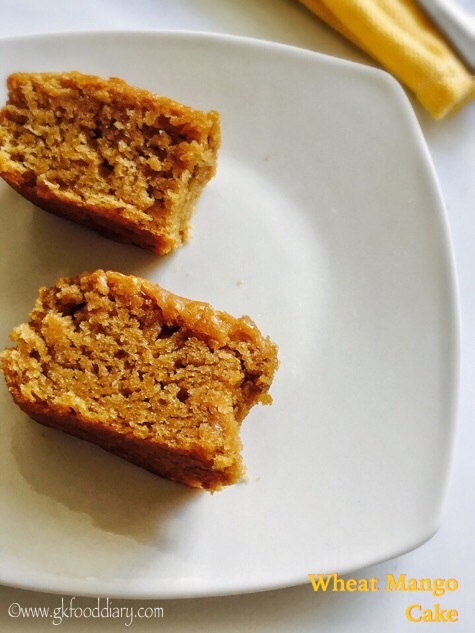 The delicious whole wheat mango cakes are ready to serve ! The color of the mango cake depends on the variety of mango used. Use sweet tasting ripe mangoes for best results. This mango cake stays well for 4 days at room temperature and keeps good for a week if stored in refrigerator. You could use any nuts of your choice.